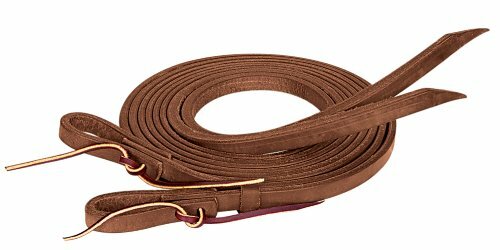 Working Tack Extra Heavy Harness Split Reins, 1/2"
Extra heavy harness leather is dipped in oil, dressed with butter and hand rubbed for the ultimate in performance and a rich golden chestnut color. 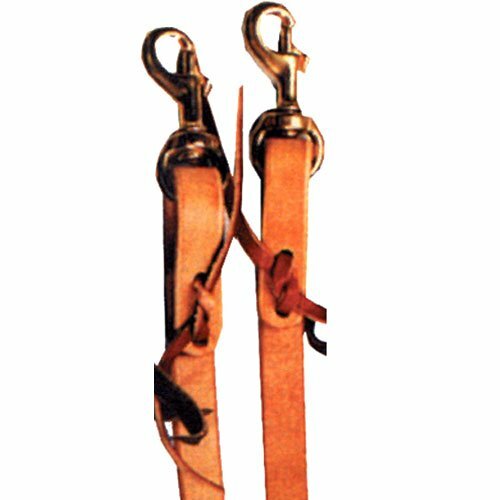 These split reins feature weighted ends for a substantial feel and water tie ends. 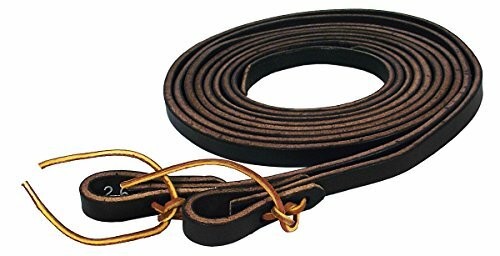 Great essentials at a great price, these dark oiled split reins are perfect for everyday riding. The simple design coordinates with a wide range of saddles and other tack. Feels great in your hands. 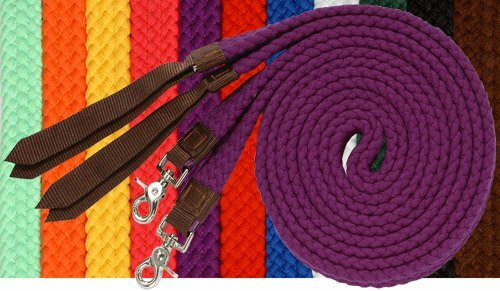 Colorful and easy to grip, the Tough-1 Flat Cotton Split Reins are made of soft braided cotton in your choice of great color options. These split reins are reinforced with nylon popper, feature scissor snap bit ends, and measure seven feet long. About JT International For over 35 years, JT International has been providing riders with quality equestrian equipment designed to maximize the riding experience. With over 1,100 different types of products available, they offer new and time-honored favorites to riders all over the world. From tack to training supplies, JT International has each rider and their mount covered. Made of soft braided cotton. Available in your choice of colors. Nylon reinforced with nylon popper. Comes with scissor snap bit ends. Measures 7 ft. long. Shenandoah Leather Split Reins This Shenandoah split rein is a soft supple 3/4 bridle leather rein. This 7 foot long rein comes with solid brass snaps. The reins can be used with or with out the snaps. Soft, yet durable reins are crafted from 5/8" spun nylon that enthusiasts say feels just like fuzzy mohair. Handcrafted by Weaver Leather craftspeople in Mt. Hope, Ohio. 5/8" x 8', Tan/Black/Brown. A must-try for any horseperson, ProTack Oiled products offer an unbelievable feel you'll appreciate. The extra heavy Hermann Oak harness leather is double stuffed for a weighty feel. It is then dipped in oil, dressed with saddle butter and the edges are hand rubbed, giving these products an exceptional feel and a rich look. You'll love the way these weighty, 3/4" harness leather reins feel in your hands. Water loops with tie laces offer quick and easy replacement. Measure 3/4" x 8'. The Horizons Collection offers great basic tack perfect for everyday riding. 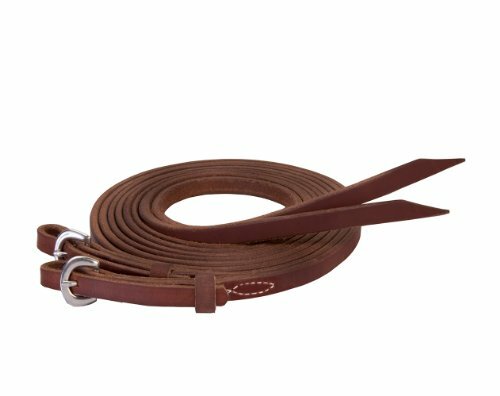 These popular reins are constructed from weather resistant harness leather that offers superior weight, strength and durability. They have smoothed edges that feel great in your hands and water loop ends with burgundy alum tanned ties for easy replacement. Measure 5/8" x 7'. 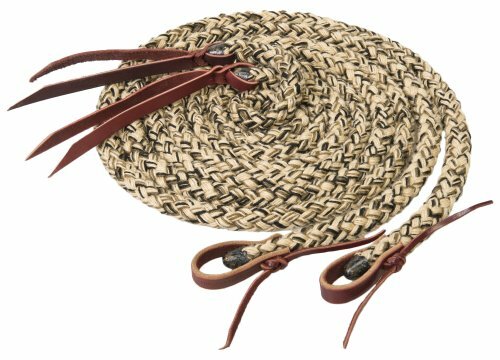 These quality braided nylon split reins feature tan nylon overlays and leather Popper ends for a Western look. Durable nickel plated scissor snap ends. Measure 3/8 inch x 8'. 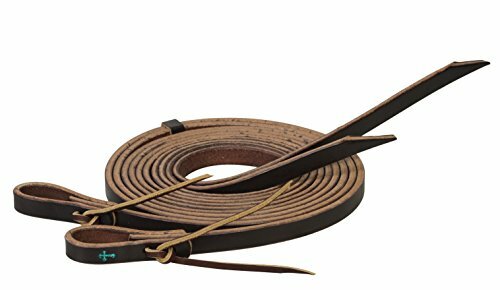 Hamilton 1/2" x 7' Single Ply Reins are constructed with loops and tie laces for attaching to the bit. Reins have a hand rubbed finish and rounded edges for comfort. Thicker Leather is used to construct these reins. 12-14 oz. hides, versus our other reins 10-12 oz. hides are used. Copyright © Wholesalion.com 2019 - The Best Prices On Split Reins Online.